The underlying philosophy of the COMPASS Method is to present and document the professional skills and intercultural competences acquired within the scope of a work placement abroad in a well-structured manner. In 5 steps, the partners involved in a mobility project (sending organisation, mobility participants and hosting organisation) can align the curricula and learning objectives in a dialogue and visualise the progress of competence gained abroad. “This is based on the COMPASS Competence-Chart. With the help of the various “Can Descriptions“ allocated to the various fields of operation, competence profiles and their changes can be shown. 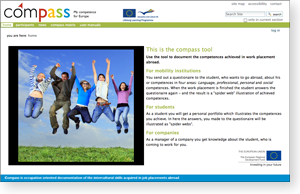 An E-portfolio is created in the COMPASS database for the mobility participants, in which they can describe their learning achievements which are then visualised as progress of competence in the “Competence Radar“. The additional benefit of the COMPASS Method is to point out the interaction between the interpersonal, social and intercultural competences acquired abroad and the professional skills, so that it is possible to incorporate learning informal or non-formal achievements into the assessment of the internship abroad. Sending organisations are provided with a tool to visualise the competence profile of the mobility participants and to align leaning objectives and thus to facilitate the selection of the appropriate company for the placement. Hosting organisations are, in good time, provided with information regarding the professional qualifications, language skills, personal and social skills of a mobility participant and his/her expectations to the work placement. Mobility participants can take active part in the alignment of their learning objectives abroad and the visualisation of their achievements and will have a transparent proof of the competence progress made. Why competence-related proof of learning achievements? Our world is getting more and more versatile. In the past few years, the new media have massively accelerated the pace of communication and global information sharing. So, people are faced with complex challenges. In many fields of work and life, people have to be able to adapt to changing circumstances. The ability to assess different situations and adapt one’s actions accordingly is referred to as competence. It is the interaction of one’s knowledge and skills, and, at the same time, the preservation of one’s values and attitudes in such a way that challenges, assigned tasks and raised problems can be dealt with and solved independently and successfully. The competence-related proof of learning achievements makes it easier to assess how well young people and adults are trained to face to challenges of society and work. What competence conception does COMPASS follow? Work placements abroad offer a good learning arena to apply the knowledge, experience and skills gained in the home country in a totally different sociocultural environment. Accordingly, it is the objective of the COMPASS Method to elucidate the interaction of professional and intercultural competences acquired during a work placement abroad. Therefore, COMPASS defines competence as the ability to communicate in a different sociocultural environment, to be able to familiarise with the environment and to act goal-oriented in order to successfully handle assigned professional tasks or everyday situations..
c) Capability to accept responsibility to shape their lives and act autonomously within complex contexts. The COMPASS-Competence Cart follows this competence conception and defines “Can Descriptions“ for international mobility projects, which gradually describe the capability to communicate in a foreign language, the application of professional skills and the orientation and integration in a totally different cultural environment. How can the “COMPASS-competence chart“ be interpreted? How to read a “Competence-Radar“? How are the learning achievements assessed in relation to the competences?